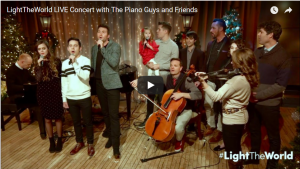 This 90-minute live #LIGHTtheWORLD concert with The Piano Guys, David Archuleta, Peter Hollens, Lexi Mae Walker, Claire Ryann Crosby, Dave Crosby, Jon Schmidt, Taylor Davis, Evynne Hollens, Tiffany Alvord, and Nathan Pacheco. Enjoy these wonderfully talented people as they #ShareGoodness and their #Christmas spirit with you. #PassItAlong.